Below are some pictures I took whilst we were speeding thru the wonderful countryside. 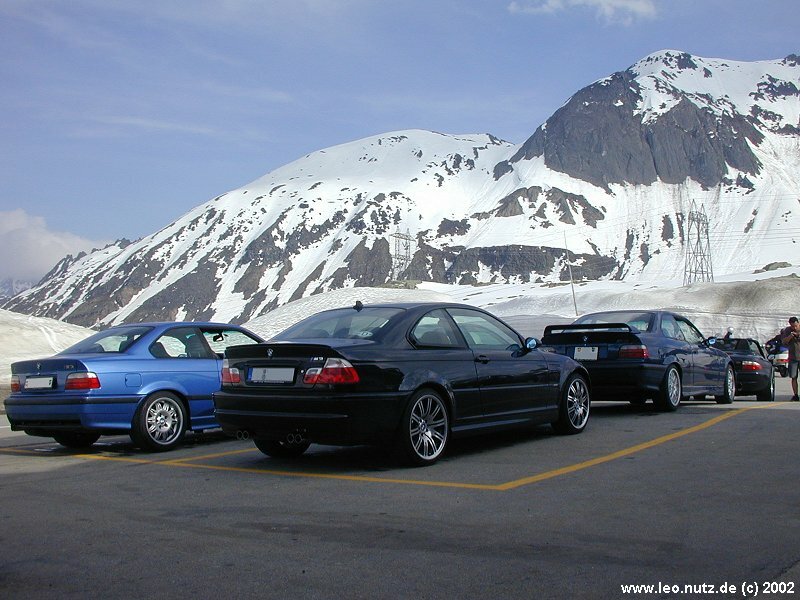 The following report is from Andreas aka M3Maniac who also attended the meet. Enjoy! So, what cars have we got here? OK, the excitement is on ! 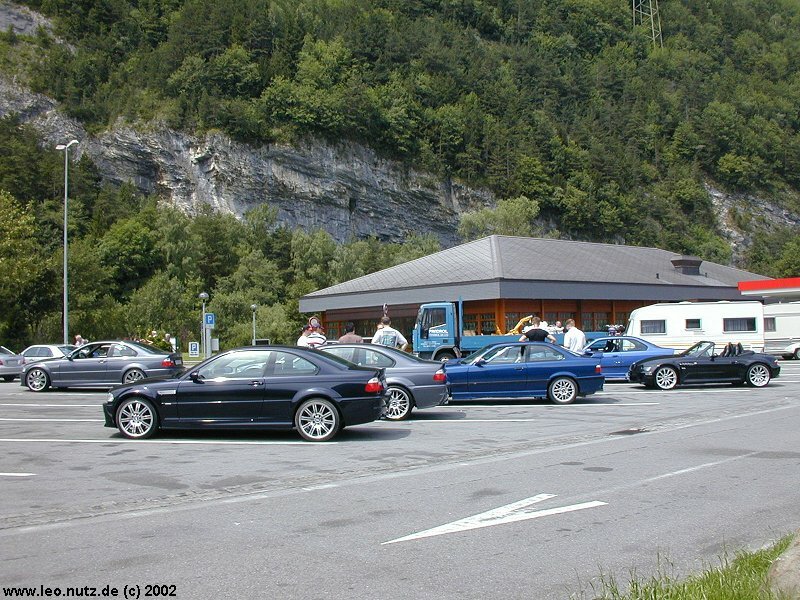 Great weather, 8 die-hard enthusiasts, 8 fantastic cars and some of the greatest roads ahead of us !!! From the meeting point we made our way to the Sustenpass. The countryside is getting more and more exciting ! The roads are already very nice with loads of turns and surprisingly little traffic. 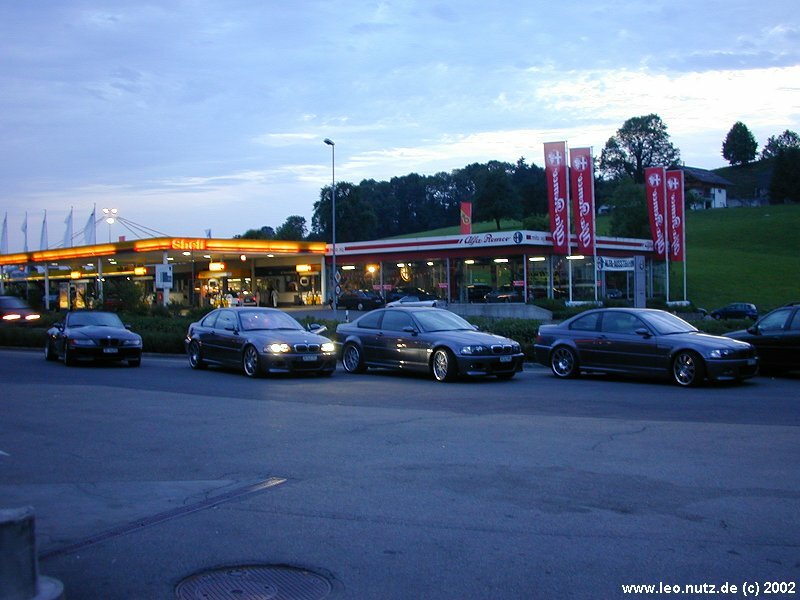 Leo took these pictures while driving behind Roger in his cool modified M Coupé. This car has an extremely stiff and very low KW setup (suspension) and huge BBS LM rims. Moreover it has a small and thick racing steering wheel. Leo told me that it was an attraction to drive behind this car ! Roger is a superb driver with some racing licenses. 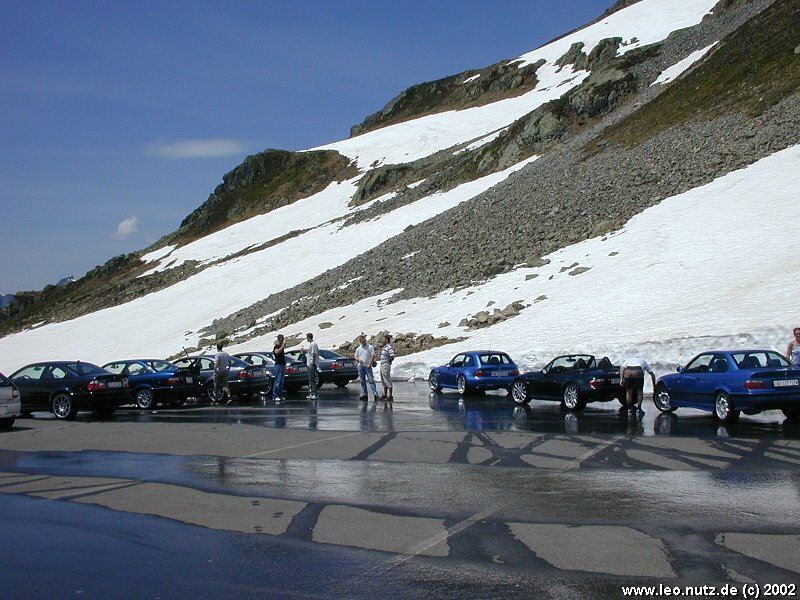 The perfectly controlled "donuts" he performed on the sustenpass parking were outstanding. Leo had a hard time to hang with Roger and his M Coupé. Beautiful countryside on the way to the Sustenpass. 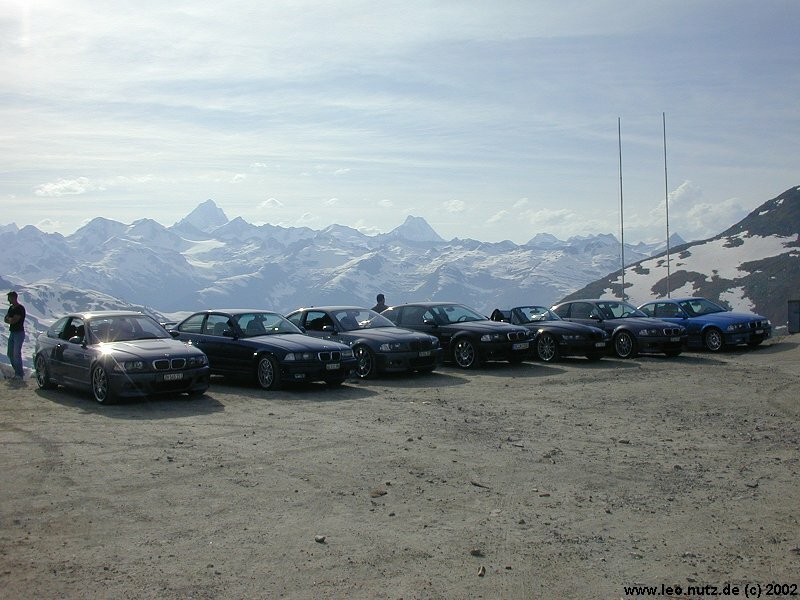 Like a bunch of children in a candy store we discuss the first of our 4 pass roads on this beautiful sunny day. It was an exciting first take and as we are hungry we go to the nearby restaurant for a break and some food. Shaking all over we stopped some Km's away from the high of the Grimselpass. 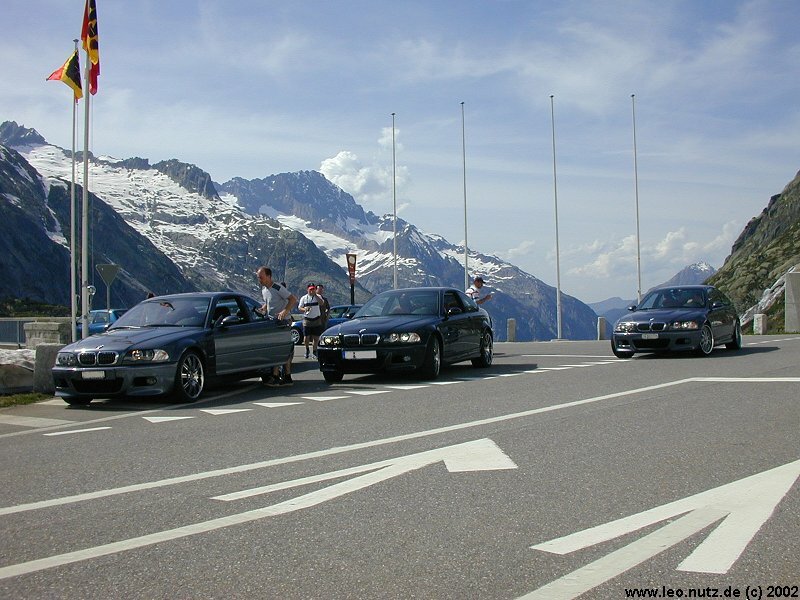 With a grin on our faces we noticed that we totally blocked the road to the Grimsel-Hospitz. But honestly we didn't care too much as there was anyway no traffic and it was time to take some pictures. 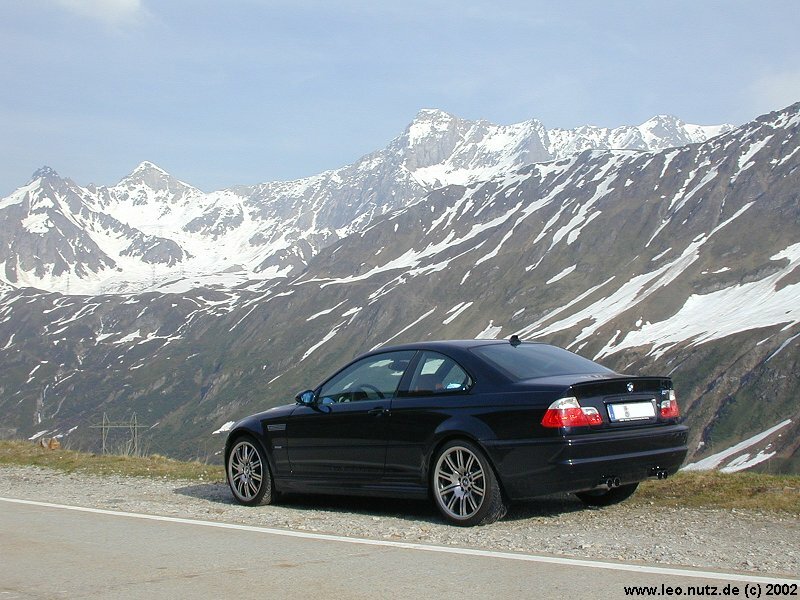 In the second picture you can see where the road was leading us - up the mountain, up to the sky, over the Grimselpass towards Gletsch on the other side of the mountain. 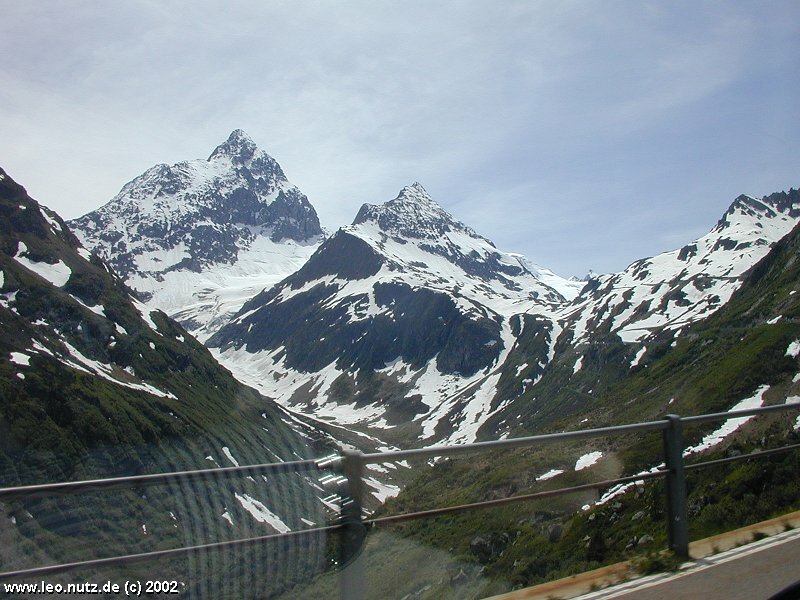 The pictures displays a short part the Grimselpass. 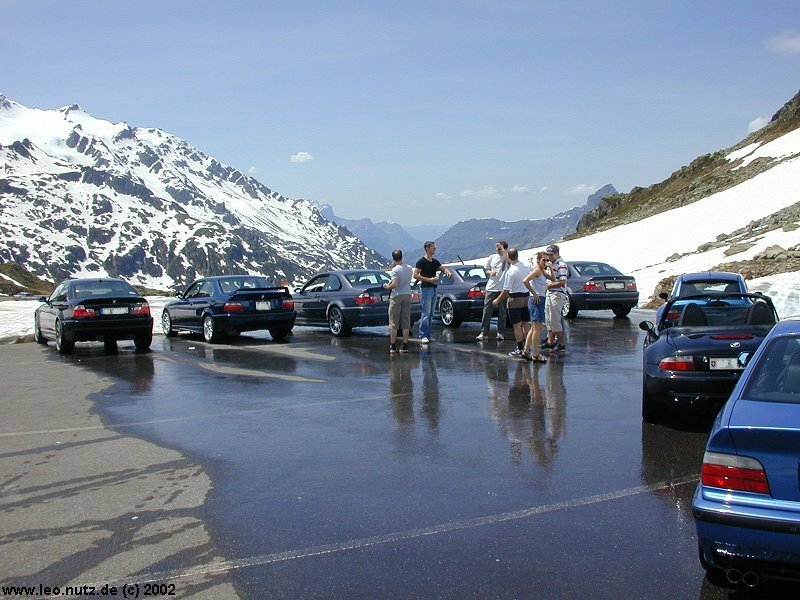 As we were properly warmed up now ;-) , we took on the most extreme of the 4 pass roads that we had planned for this day: the Nufenen. 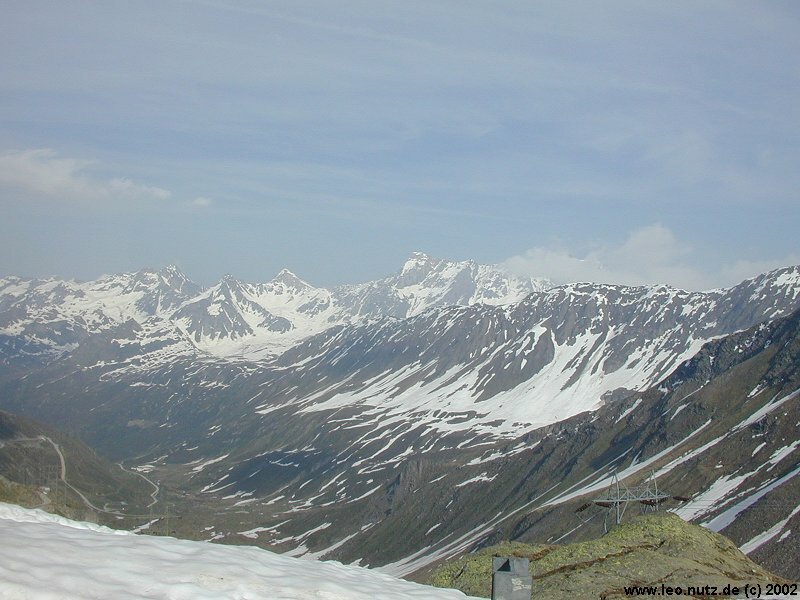 With 2'478 m above sea level on the road, the Nufenenpass is the highest in the central Alps. 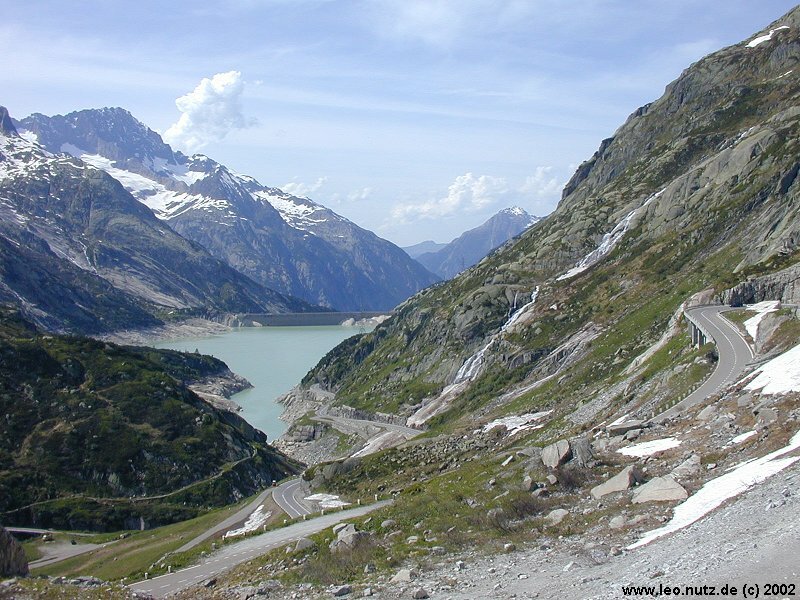 A steep road with many vicious sharp curves and sometimes uneven surface (don't forget the water on the road which was coming from the snow...) makes this road a challenge for man and machine ! Huge Snow walls in the last part of the road give the driver a feeling as if he was driving up a bob run - crazy and very unique !! One could really feel how the car was losing power in the highland how the suspension was fighting the difficult track. In one word, it was OUTSTANDING! 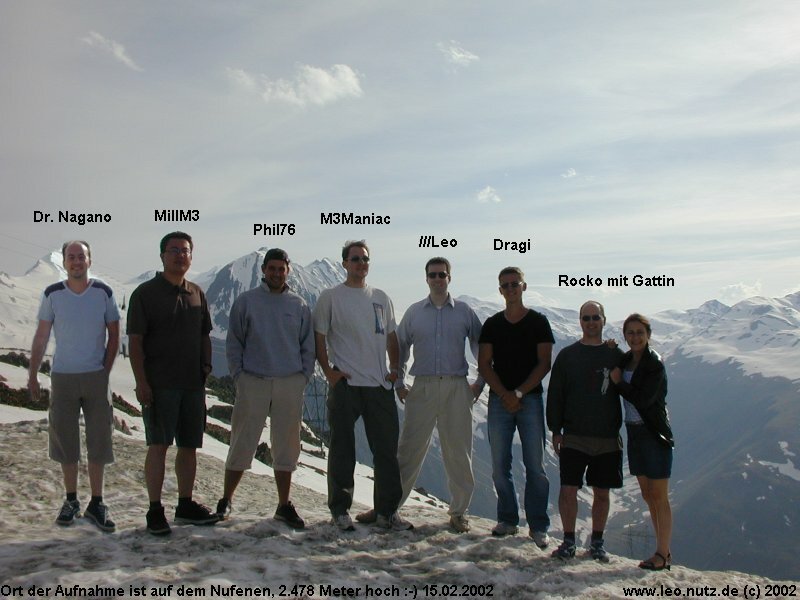 Time for a group picture before we continue the journey... that's the "M" gang :-) It was endless fun, guys ! Let's do it again sometimes soon. 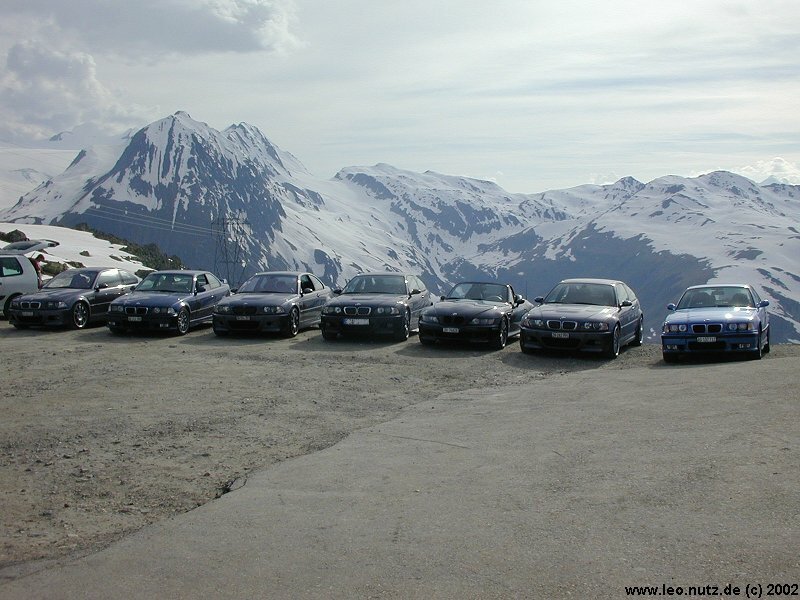 When we completed the photo shooting it was already around 7 p.m. and the air on the Nufenen was getting colder and therefore we accessed the cars and made our way downhill heading for Airolo in the beautiful Ticino. The road through the Valley Bedretto coming down from the Nufenen was like a dream. On the next picture you can see the road coming from the Valley climbing up the mountain like a giant snake... and again... no other cars ! It was all ours... and so we were driving through the Valley Bedretto at very high speed [officially: slightly more than 80 Km/h :-)] in the intense light of the setting sun. It was like magic! 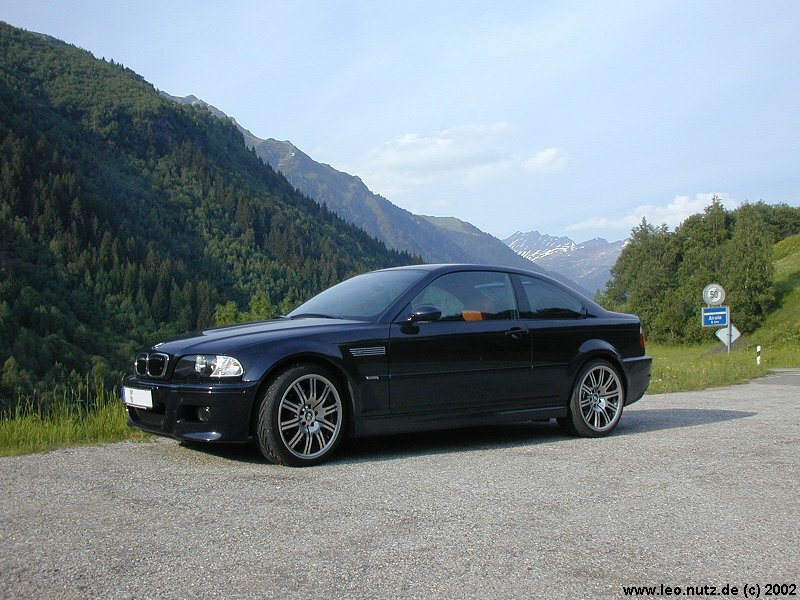 In Airolo we stopped again and Leo made a video clip of Dr. Nagano's Supersprint exhaust on his E46 M3. 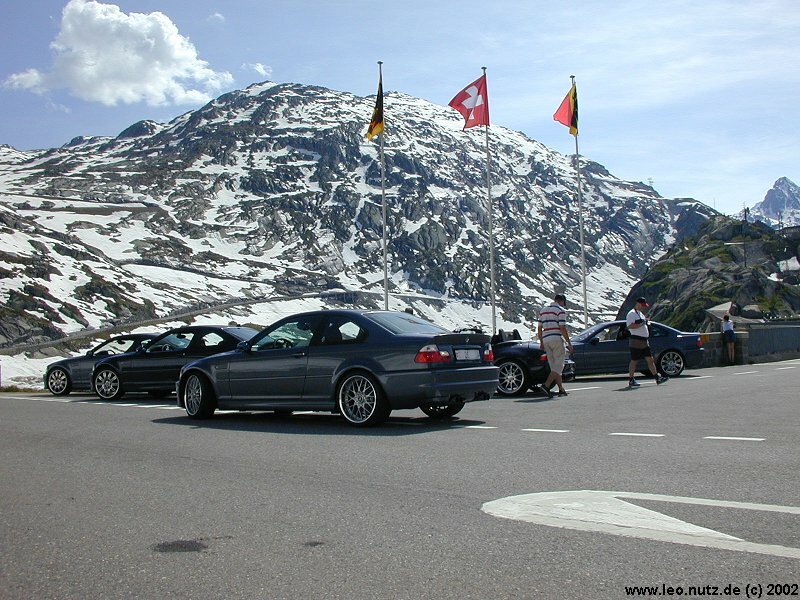 5 of us decided to drive over the Gotthardpass on our way back to Zurich. 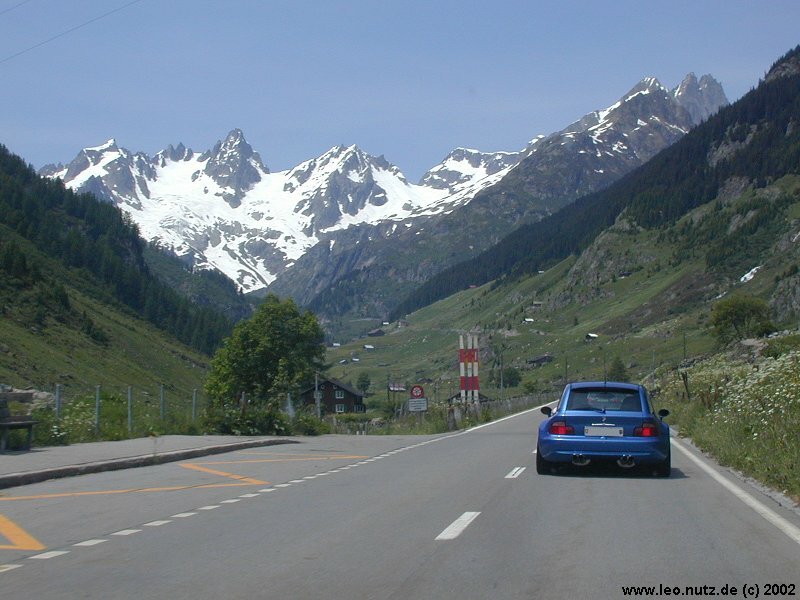 MillM3 und Rocko decided because of the late hour to go through the mountain (+17 Km Gotthard tunnel). 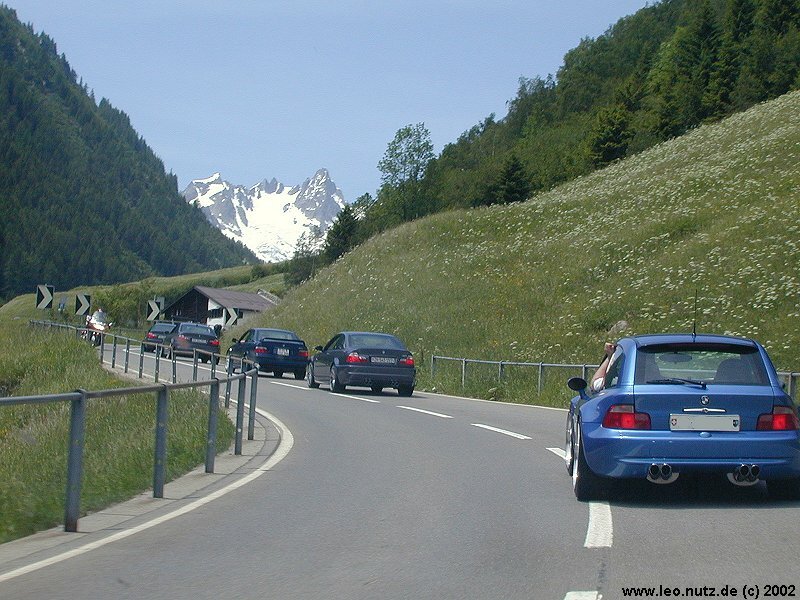 The long upper part of the Gotthardpass is almost sort of a motorway (as you can see on the picture). It was already getting dark and we raced uphill the Gotthard at tremendous speed. 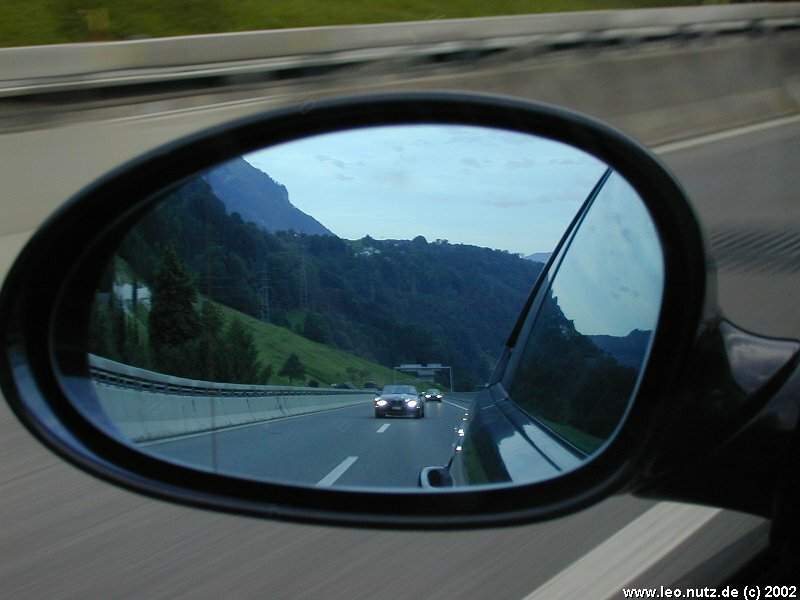 i don't really want to know how Leo took this picture where you can see Phil76's M Roadster flying up the Gotthard in Leo's rearview mirror :-O !!! But I think it is a very cool pic !! 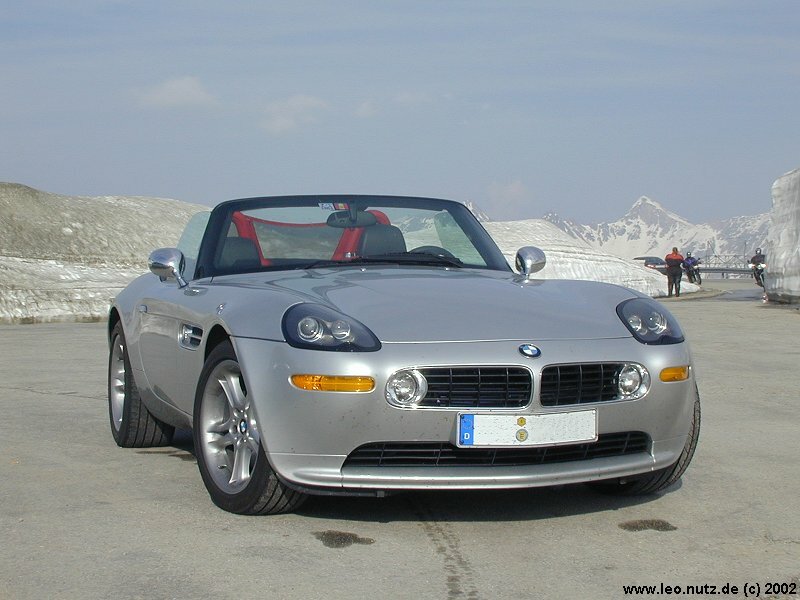 On the other side of the Gotthard I was struggling with my car... I don't know why ! I experienced problems with the grip on the front tires which forced me to slow it down a bit. From Sihlbrugg Leo got on his long way back to Nürnberg (Germany) while Dragi and I drove through the Sihlwald (Sihl forest) heading for Zurich.